The writing team is delighted to announce the immediate availability of our new eBook “Office 365 for IT Pros – Third Edition” at ExchangeServerPro.com. The PDF (for PCs) and EPUB for many eReaders, including the iPad, are available now and the Amazon Kindle version is available for pre-order, with a release date of June 12 lined up. Nineteen months ago, Paul Cunningham and I started work on the idea of creating a book that would help Exchange on-premises administrators move over to Office 365. After roping in Van Hybrid as a co-author and enlisting the services of Jeff Guillet as the technical editor, the first edition was released at the Microsoft Ignite conference in May 2015. The first edition, which we named “Office 365 for Exchange Professionals”, was flawed and imperfect, as all first efforts are, but it was a fantastic learning experience for us in terms of how to put together and publish a book. We wanted to do something different, to have a living book that took advantage of the power of the Internet to keep pace with the changes occurring inside Office 365. This led us to the concept of pushing out regular updates for the book, which is what we now do. Sometimes updates occur every few days, sometimes it’s every few weeks. It all depends on what’s happening inside Office 365 and if we find mistakes (editorial, formatting, or grammatical) that we need to fix. When we began work, we always knew that we would release new editions when we considered that we had enough new material to warrant such a release. The second edition appeared in September 2015. This was possibly too soon after the first edition but we wanted to correct some of the flaws that were apparent in the first edition. Anyway, the version of the second edition that is currently available is considerably different to what was released in September because we have made so many changes over the intervening period. That’s one of the joys of e-publishing: if you’re unhappy with a book, you can keep on working on it until the book is in a shape that makes you happier. Over the last year, we also brought the book to Amazon to make it available to Kindle users and have looked at the feasibility of printed copies. Formatting for Kindle proved to be one of those “interesting” challenges that are supposed to build character. We’ve spent a lot of time during this release cycle to improve the formatting for both EPUB and Kindle, particularly around how PowerShell examples are displayed, and although these are better, we know that more work is needed in this area. Kindle isn’t profitable when you look at the number of hours that are invested into preparing a large technical book for publication through that channel compared to the net revenue after Amazon extracts its 70% fee, but people do like having books on their Kindle devices and we’re happy to facilitate that choice. Printing books, which we did with the support of Microsoft for the first edition, is an expensive and time-consuming business. We’re still looking at whether this is a good road to go down. The biggest concern is that printing delivers a point-in-time version of the book that we can’t update. This is fine when technology doesn’t change all that often, which is why printed books worked so well in the past when a new version of an on-premises product like Exchange or SharePoint appeared once every three years. However, when you’re trying to cover a topic like Office 365, a service that introduced 450 changes in the year to August 2015, doing so in a print format is an interesting problem to contemplate. As proof of the issue, just look at all of the print format Office 365 books that are available today. We’ve learned from our experience that any material that was published more than a year ago is now very outdated and anything past that point is possibly misleading and invalid. That’s a real problem for us. But on the other hand, when we surveyed readers, we heard that print was still the second most popular medium for technical books and that people would like a printed version. We’ll keep an eye on the evolving methods that are available for print-on-demand distribution to see whether we can do something useful in this space. We’ve been working on the third edition since February. This is our biggest release yet and because of a massive change in scope and the amount of new material covering new topics, we’re also changing the title of the book to reflect that content. 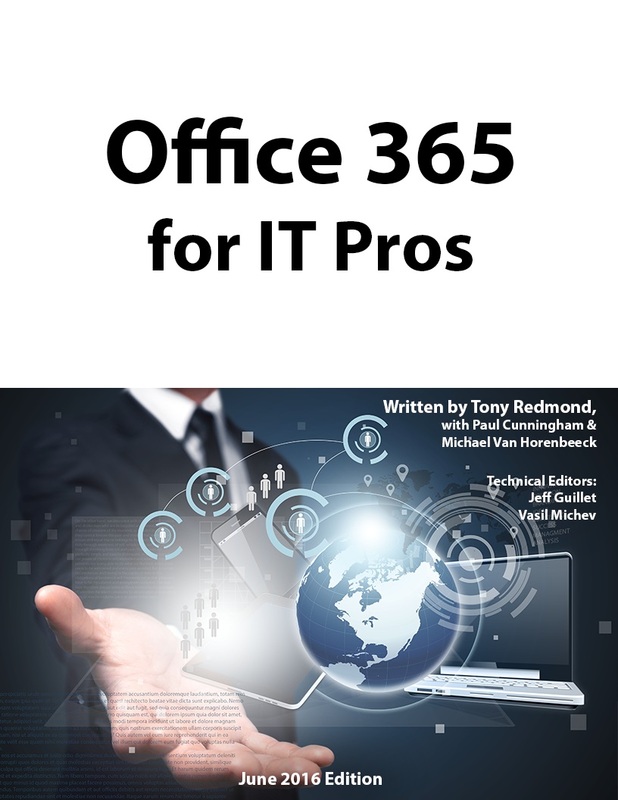 Instead of “Office 365 for Exchange Professionals”, which we used for the first and second editions, the third edition is called “Office 365 for IT Pros”. The new title reflects the real breadth of the book and we think it’s the right one to use going forward. 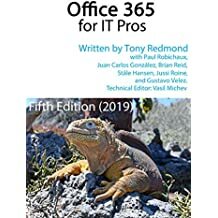 Office 365 for IT Pros extends to over 800 pages spanning 399,000 words in 24 chapters, and includes 688 practical examples of PowerShell being used to interact with different Office 365 workloads. We’re reducing the price of the book by $5 to $39.95. Early-bird discounts are available on ExchangeServerPro.com until mid-June. Those who notice these things might note that we reduced the margins on the pages to make them more like U.S. trade-size books. If we ever decide to print copies, this change had the bonus effect of reducing the number of pages required. We also removed a heap of graphics that we didn’t think added as much value as we wanted. Overall, the book is about 10% longer but we estimate that we added about 250 pages of new material. In addition, every existing page was checked by multiple people to ensure that its content reflects what we see today in Office 365 rather than what we might have observed in late 2014 when we started to first write. Revising the text covering feature areas that have received major updates over the last six months: Admin, Office 365 Groups, HCW, and the Security and Compliance Center. Expanding the book’s focus to encompass all of Office 365 rather than a prime focus on Exchange Online. Exchange remains important and there’s lots of content covering how it works in the book, but the balance is better. Revising the structure and flow of the book to bring common material together (like identities and authentication – now covered in chapter 3). Removing of material that is of lower interest (site mailboxes), takes up lots of space (migration steps and history of Exchange), or is redundant. The material that we consider still valuable is available to customers through 100+ pages of downloadable bonus files. We are proud of the in-depth coverage of areas like Office 365 Groups, Planner, Clutter, Office 365 Video, Delve Analytics, and Exchange hybrid connectivity – it’s at a level that we believe is simply unavailable in such a comprehensive form elsewhere. We received great help and assistance from many people at Microsoft who work on Office 365 to parse out what really happens behind the scenes of features like Delve Analytics. In addition, we are grateful for the help and advice that we had from many of our fellow MVPs. We also acknowledge with gratitude the contribution of our technical editors, Jeff Guillet and Vasil Michev, who played a huge role in refining and improving the text. Our biggest issue now is curating the mass of information we have assembled to ensure that it remains accurate, up-to-date, and interesting. That’s a challenge we accept with relish. We also need to continue to work hard to expand the non-Exchange content to enable readers to more productive and effective with all of Office 365. Thanks for all your support to date. We hope you enjoy the book. And if you’d like to listen to Paul and I discussing its creation, why not download the podcast on the topic. This entry was posted in Cloud, Delve, Delve Analytics, Exchange Online, Office 365, Office 365 Groups, SharePoint Online and tagged administration, Delve, Delve Analytics, Exchange Online, Management, Office 365 eBook, Office 365 for Exchange Professionals, Office 365 for IT Pros, Office 365 Groups, Office 365 Planner, Office 365 Video, OneDrive for Business, SharePoint Online. Bookmark the permalink. I have the first edition from 2015 and upgrading to the 3rd edition was a no brainer. I like the premium package with the video links, Powershell starter guide and the price I feel is very reasonable . Thanks Tony and Paul for all your great work.